There is a DIY Rotating Goal List on fire on Pinterest right now, you can find it on Cornflower Blue Studio. Here is a bare bones Rotating Goal List for your printing pleasure. 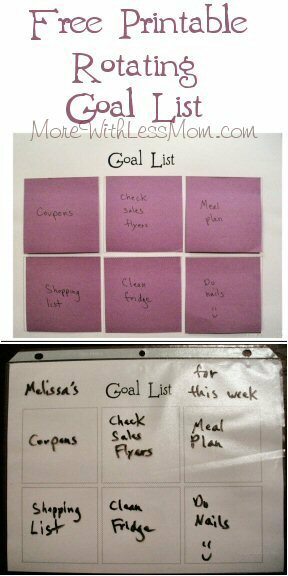 You can use this by putting posty notes in the boxes, or put it in a sheet protector and use a dry erase marker. It prints on regular paper, so you can print and go. No silly waiting around. This is a Word .docx file, so it is easy to customize. You can add your name, a time frame for your goals, a pretty graphic… mine will see some glitter later. The font I used is Brandywine from Scriptorium Fonts. I apologize, I am totally not a professional photographer. This file is free for use, reuse, duplication, modification, or whatever other torture you can think of. I designed it to be vertical/sideways, but apparently turned it to horizontal to take the photos.